Throughout its long history Pu-erh has been reserved by the Chinese imperial court as a Tea of Tribute - as represented by these beautiful melon-shaped tea 'tributes'. Golden Melon Tribute Pu-erh is steam-pressed from Pu-erh tea leaves and named for its plentiful golden tips and attractive melon shape - symbolizing bounty and prosperity. Available in 500 grams each. 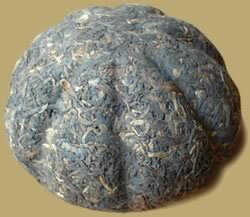 PREPARATION: To prepare Pu-erh tea from golden melon, pry out the desired amount leaves and place in a teapot. Rinse by covering with boiling water and quickly pour off. Cover with boiling water again and let steep 5-30 seconds (depending on how light or dark you want the tea) and serve. Pu-erh tea can be steeped 10-20 times.